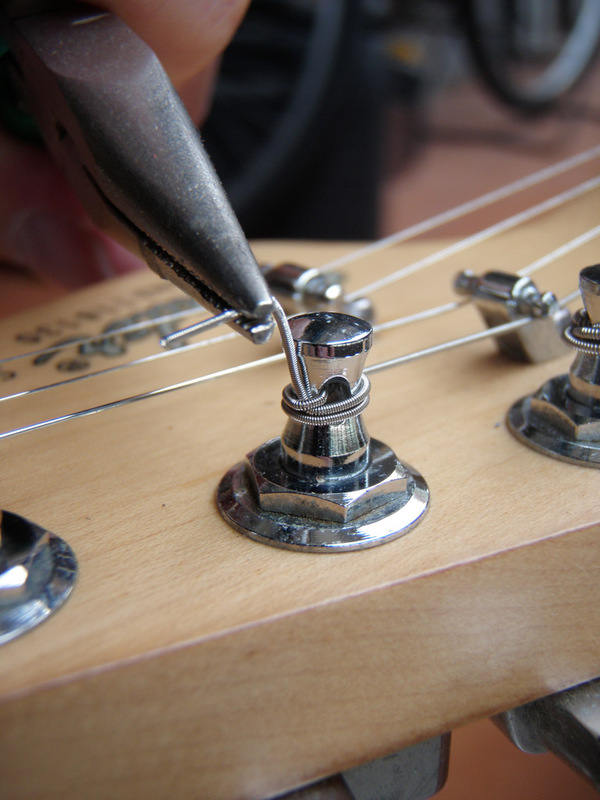 There are many ways to string a guitar. After twenty-five years of replacing strings on all manner of steel-string guitars, this is the method that I’ve settled on. There are, of course, other methods, and you are more than welcome to try them out. 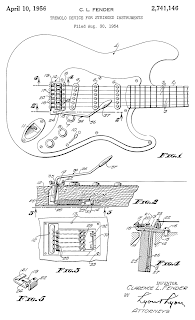 For this blog post, I will be stringing a Fender Stratocaster, but this method works for pretty much all steel-string guitars, both electric and acoustic. 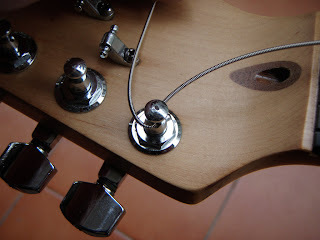 That said, there are some locking tuners or split shaft tuners that should be strung in a different way. 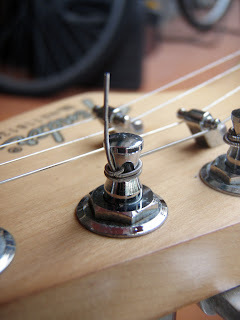 For that reason, I should state that the following instructions are intended for standard tuners. 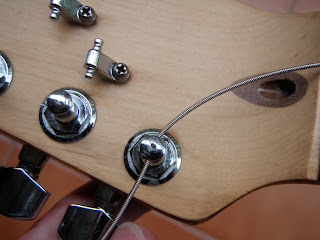 Remember that if you have a 3-a-side headstock (there are three tuners on each side instead of six on one side), you will have to string the G, B and high (thin) E strings in the opposite direction to what is shown in this post. 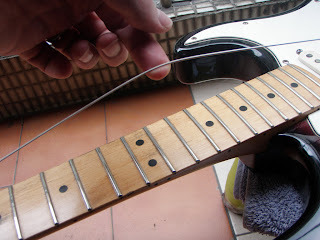 Firstly, connect the ball end of the string to (or through) the bridge of the guitar (I usually start with the low (thick) E-string. 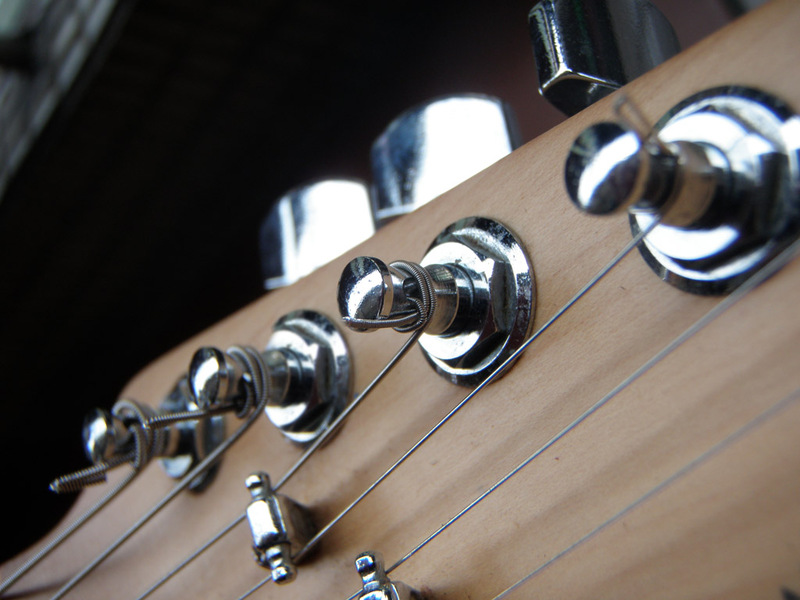 Obviously this step varies enormously, depending on the type of guitar you are stringing up, but it’s usually pretty simple. I plan to put a post up soon specifically talking about acoustic guitars and their fiddly bridge pins, but in the meantime I will have to assume you can handle this part. 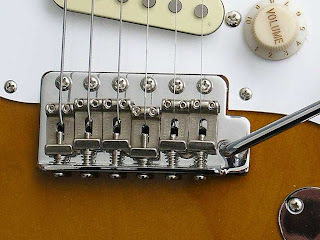 Continue to pull the string through the tuner, as described above, but leave enough slack that you can raise the string off the fretboard by about 3 or 4 inches (75 – 100 mm). 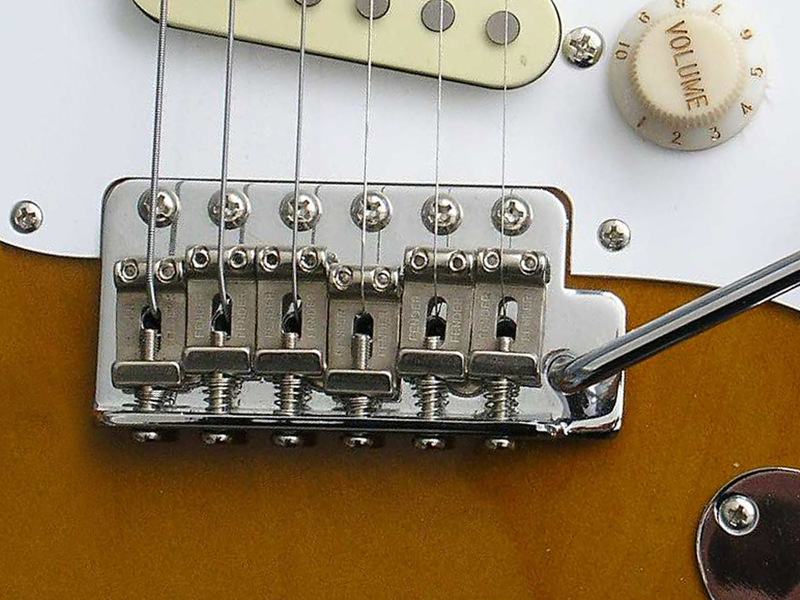 As a general rule, the thicker strings don’t require quite as much height here, so let’s go for 3 inches for the thick E-string, gradually moving to 4 inches for the thin E-string. 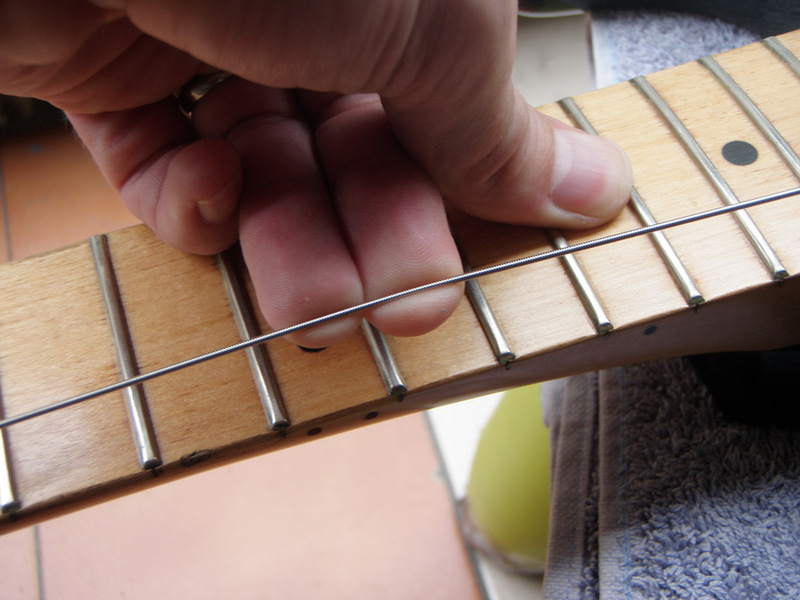 Now pull the string back in the other direction over the top of itself, being careful to keep tension on the fretboard end of the string using your other (probably right) hand. This tension is important for two reasons. 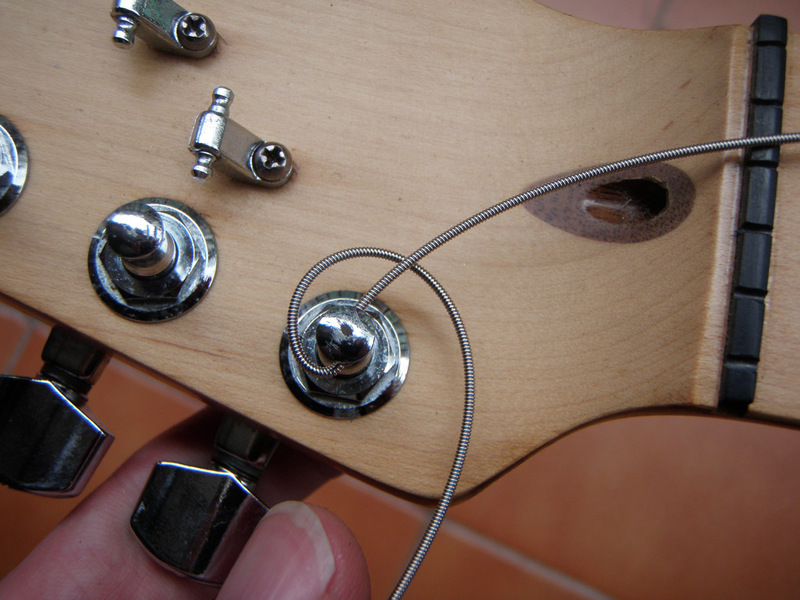 Firstly, it will keep the ball end of the string tight against the bridge so you don't get any surprises once you start tuning up. Secondly, it will give you a nice tight "knot" where the string tightens over on itself at the tuning peg. If this is slack in any way, you may end up with some string slippage when you are not expecting it. There's a real trick to keeping tension at both ends of the string here (unless you have three hands), but I find that pressing down with my (right) thumb on the string just above the nut, while pulling UP on the string with the rest of my (right) fingers will get the job done. 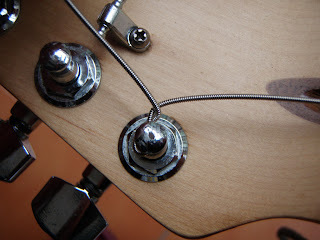 While still maintaining tension with your right hand, rotate the tuner in an anticlockwise (counter clockwise) direction to start tightening up the string. Before you tighten the string to pitch, make sure it goes under any string retainers, etc. 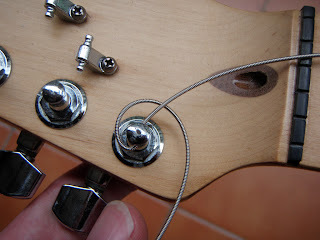 In some exceptional cases, you may actually have to feed the strings through the string retainers before they get to the tuners (you may be able to get around this by loosening the retainer a bit then tightening it back down once the string is under it). Once the string is tuned to pitch, grab it and pull it up a bit to stretch it. You can do this a few times, but be careful not to over-do it, risking string breakage (especially for the thinner strings). Cut the string ends to leave about half an inch (12-13 mm) sticking out. Alternatively, you can just cut them as close to the tuners as you can (a lot of pros do this), in which case you can skip the next step. I prefer the method I use because I have a couple of small children and prefer not to have any sharp ends, even if they are mostly recessed (the strings, not the kids). 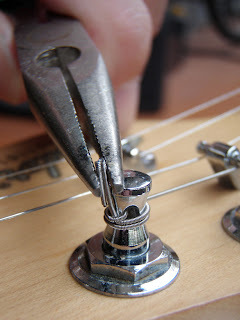 Now, using some pliers, fold the end of the string in half so that you do not have any sharp ends. And that’s you done. You should find that this method will prevent string slippage and help to keep your guitar as in tune as possible. As usual, feel free to ask any questions or leave any comments below.